The past two Thursdays we have traveled to the Volta region – one trip to witness tradition, the other to indulge in tourism. Both were early morning trips to the furthest eastern region of Ghana. The region is the major Ewe region of Ghana, it was decided by the British to slice Ewe-land in two after the defeat of the Germans in World War I. The major ethnic group and the remainder of Ewe-land is in Togo. The British were greedy. The route we took was a toll road, no speed bumps or potholes (relatively smooth ride) straight across from Accra into Togo. I couldn’t sleep and our guide accompanying us told us before we left that in the Volta Region we would see things that we may have only dreamed about. Everyone tells us that whenever we travel we will see something so different. This really say something for the small country of Ghana, that just traveling to a different corner of the country can be such a unique experience – this says something more for Africa, since Ghana is one of its smaller countries. As we left the Accra area we passed many huge, mansion style, western homes built far from the city’s busy, crowded and slightly imposing character. These palatial (check that out mom) homes seemed to present a city of their own set above the rest. Further out was the land of big trucks and truck stops. Rows upon rows upon rows of trucks; tanker, flatbed, carrier, produce, waiting for cargo filled a long stretch of road. Even further from the city everything turned to green. Oh so green, we passed a lush landscape dotted with trees and two-person high mounds of red dirt – this was the kingdom of the termites. The mountains in the distance were highlighted by the rainclouds overhead. 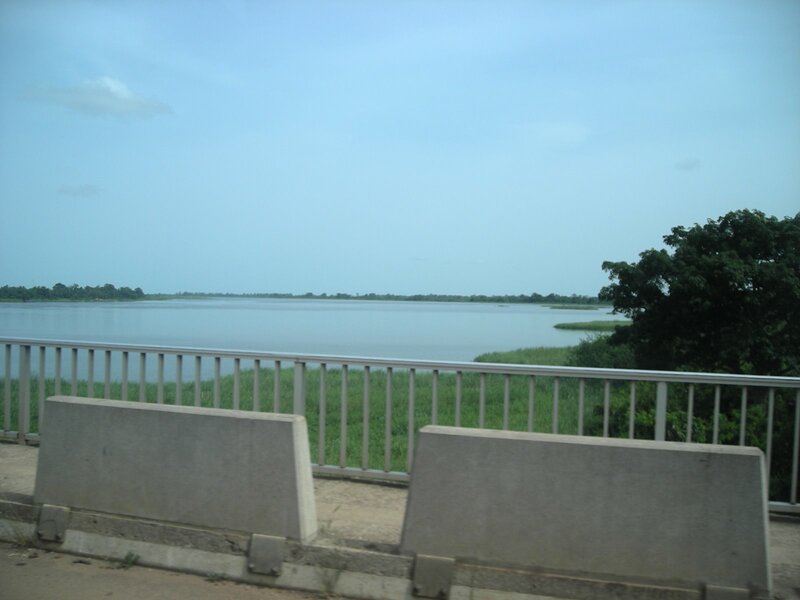 After crossing the man-made River Volta we were finally in the Volta Region. Here we were treated to a very different ride – massive potholes. The bus zigzagged the roadway to avoid the potholes and crevasses – it felt as if we were in a Star Wars asteroid field. It seems that the government does not have much to do with the region. We first went to visit the local chief of the village of Klikor, which is one of the important settlements of the Ewe people. The chief has ruled over a kingdom that is over 400 years old. The chief commented on this related to development. He noted that they were much older than the US, but that they were less than one-tenth as developed. 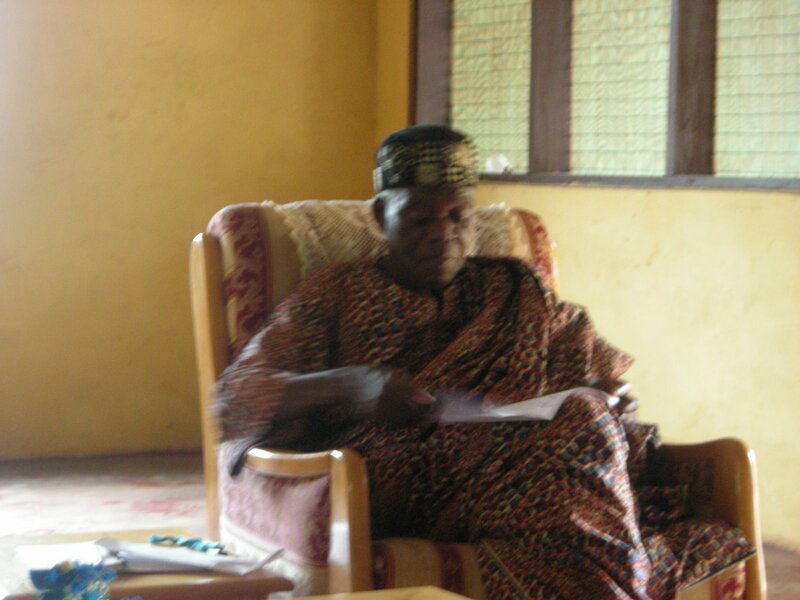 He orated a great history of his people, village, and how they eventually settled in Klikor. It was almost like living the reality of so many books that I have read. He also gave us a history of Ford and what he did for the US. He mentioned that everyone here (Klikor) had benefitted from the Ford Foundation, how I am not sure. But he did make a great point that President Ford was not one of the wealthiest men, but he left a great deal to charity and his foundation. The chief went on to tell us what to tell our friends back home, but instead jumped into a lecture on the US and Iraq. This is about the fourth such lecture that I have experienced on this trip. He made an important note that even the ‘smallest mistake of the US’ has an impact around the world. One of the students later commented on how “Africa-esk” that experience was – this is Africa! 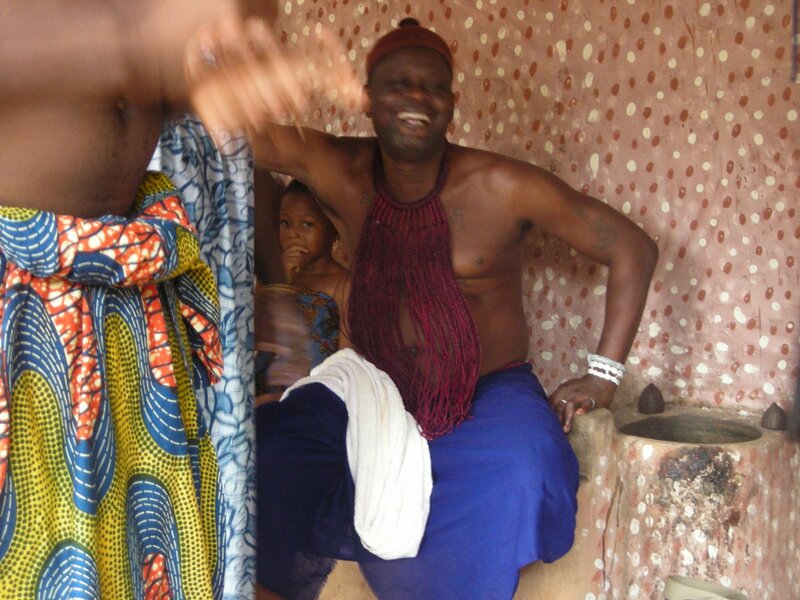 We then traveled to another part of the village to experience traditional African religious practices. We were to see a ritual possession ceremony. Before the ceremony we were treated to the most simple, but delicious meal that I have had yet -the best tuna that I have ever eaten. We changed into the proper dress – a wrapped cloth. We were welcomed with drum and song and given kola nut and whiter clay as a sign of welcome along with a small, narrow, triple shot coconut cup of dry gin which tantalized the throat and assisted with the dancing later. The possession had already begun and the high priestess already conveying messages from the sea-god. I have complete respect for the traditions of the village, but throughout the ceremony I could not help but think that this was a performance. I think Kyle put it best during our discussion of the ceremony, “It is like a choir performance, we may never understand what is happening, but it is still a performance.” The performers exchanged knowing looks and laughs and my thoughts were solidified. I mean no disrespect, and I really think that our experience would have been different had we been embedded in a village and taken part in the ceremony firsthand. The rains had come as we ate and continued throughout the day. We left and our bus navigated the narrow ‘roads’ of the village where bikes and motorcycles dominate the streets. The typical houses were mud and thatch, the wealthy had cinder block houses. We returned home in the growing rainstorm. Memorial day spent in Ghana, I hope the water is not too cold for putting the dock in. This is the first time that I have really thought of home. It is plenty warm here to put a dock in any day. This was another early morning headed back to the Volta Region to see the waterfalls. We took a much different route than before since the falls are about 6 hours drive from Accra: three hours to Volta and then three hours more in Volta. 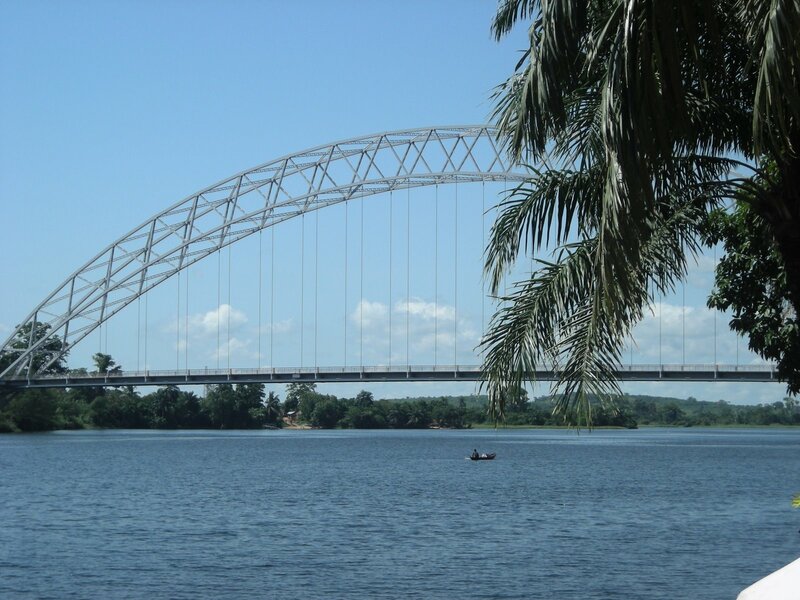 This time as we crossed the Volta River, we stopped at a riverfront hotel. This hotel was very nice, a prime place to spot an Obrooni. There were none, but there were monkeys and exotic birds in cages. There were speedboats and jet skis to be rented and a very nice pool to swim in. We had entered the second Volta. We crossed the river this time by way of a nice large bridge. 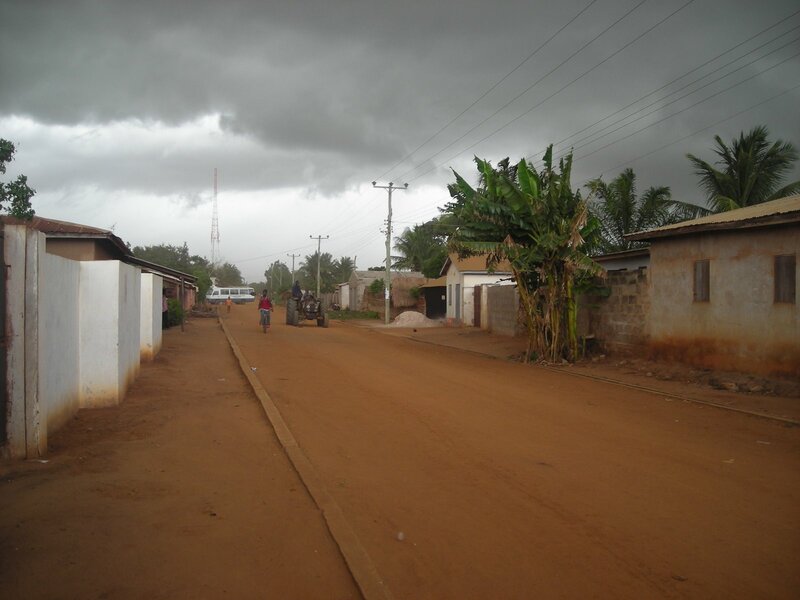 and the roads showed that the government had not neglected this tourist favorable side of Volta. We arrived at the falls and met our guide. He took us on the 40 minute walk to the falls and showed us some of the local trees and wildlife as we went. He told us that behind the mountain pictured was Togo, so close. 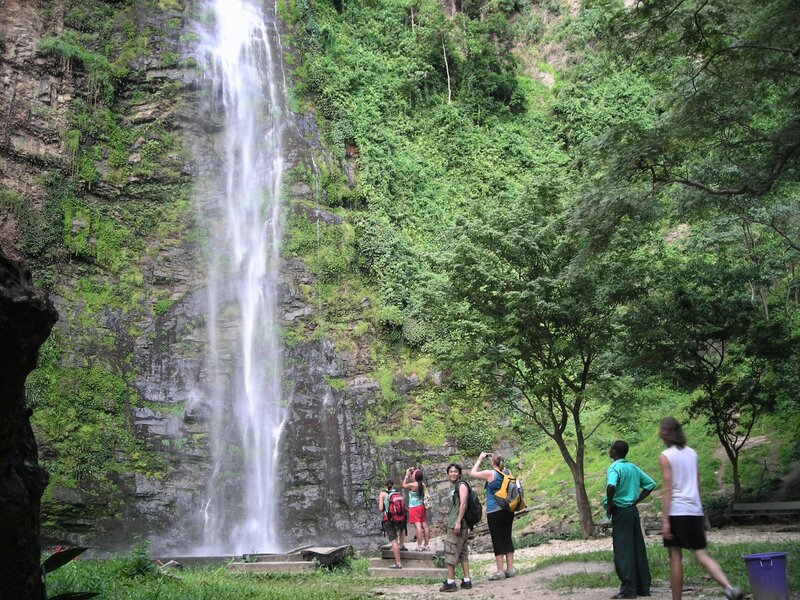 We journeyed through the beautiful wilderness and finally heard the sound of the falls and saw its wonder. 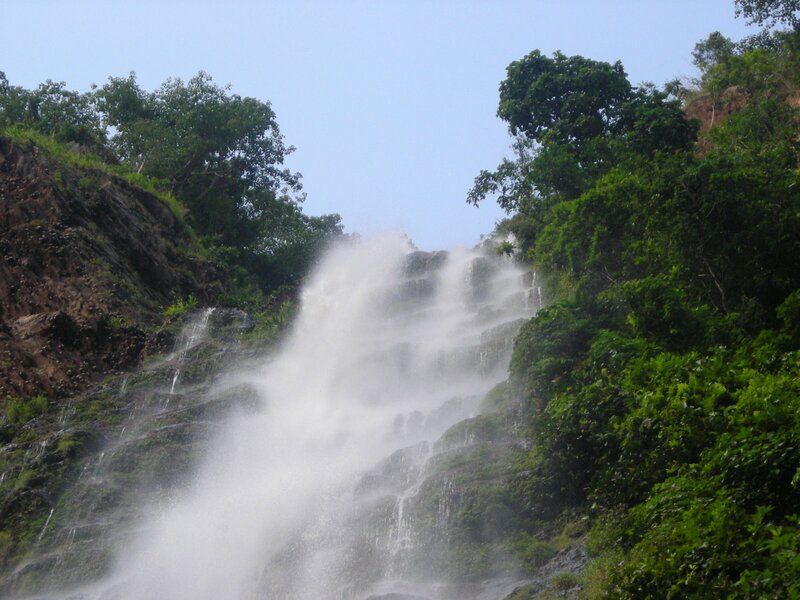 The falls were amazing, the tallest in all of West Africa. 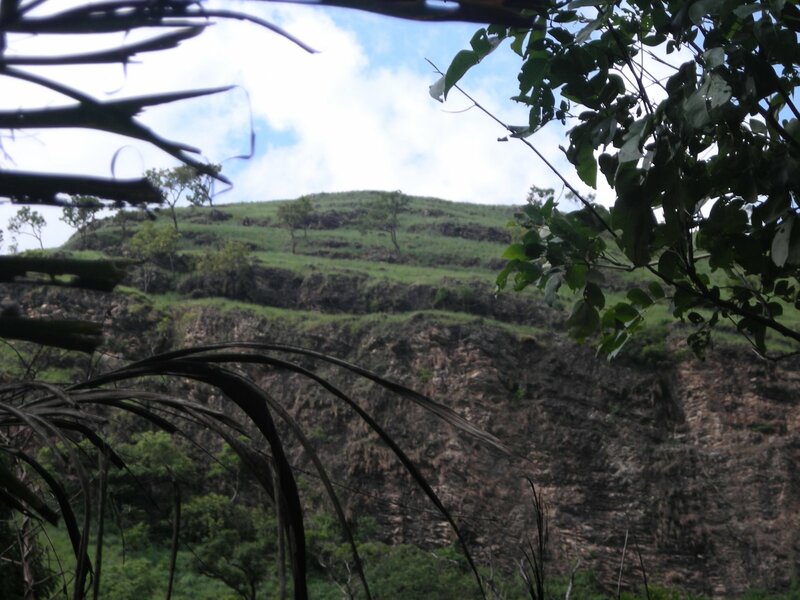 The fruit bats covered the mountain side and screeched and sprang to life as the group screamed and swam in the falls below. It was incredible to see. I wish that I had not forgotten my swim trunks. Next time. These experiences brought to life my thoughts that there are two Voltas in Ghana. We saw them both and I guess if you can bring the government tourist money then you will have paved roads, nice hotels, and the access to basic infrastructure like electricity. This also makes me think of George Packer’s chapter in The Village of Waiting titled ‘Three Africas.’ I think it is very interesting that what he explains in the pages of his book, I have seen in my limited African experience. I saw the ‘village’ Africa while traveling rural Uganda, the ‘tourist’ Africa in the Queen Elizabeth National Park of Uganda and the waterfalls of Volta, and the new, growing, struggling Africa in the booming city of Accra, Ghana. Full of new technology, development, and thriving with entrepreneurs. These three Africas can be seen on any travel to Africa, but most of the time these three very different Africas are only seen one at a time. Does that mean that I have seen the true and complete Africa? I think not, I have only traveled to three countries in Africa – there is so much more to see! Another great blog full of things that make my excitement grow even more for the day that I will get to experience some of these things. I am glad to hear that you are having such a good time. I love the video. Have you learned those beats for your drumming yet?